Cynthia joined Belmont in 2013. Cynthia was previously on the Board at Brighton & Hove Hebrew Congregation where her work included organising the kiddushim and the shul's community care. She was on the Brighton & Hove Jewish Welfare Board for many years. Cynthia has worked as a Radiographer, a dispenser and in financial services. She was also a Magistrate for 16 years. Cynthia is married to Ronnie and they have two married sons and six grandchildren. Cynthia enjoys reading, knitting and walks around London. Suzi joined Belmont in 2002 soon after her marriage to Raffi. They settled in Stanmore, just down the road from her roots in Edgware. This will be the third year on the Board of Management, returning after a year off. Previous involvement includes taking youth services, running youth trips out and organising some in-house events for the younger members of the community. Suzi is an optometrist by profession, having qualified in 1998, and is currently working for four independent optometry practices. She derives great satisfaction in her work and enjoys helping the public regarding their eyecare needs.. Suzi has two children, Anya (13) and Coby (9) who are regulars at Belmont. Both kids love getting involved in shul youth programmes and are very much part of the younger Belmont community. One of the Bergs’ high points at Belmont was the Bat Mitzvah of Anya exactly one year ago, a wonderful simcha they shared with the community. Caroline has been a member of Belmont since 2004. She has served on the board before. Caroline was co-chair of the ladies guild for many years having responsibility for organising the weekly Kiddushim. She 'retired' from this role last year. Caroline has worked at Beth Jacob Grammar School in Hendon for 28 years. She is Deputy Head Teacher and teaches maths. She has two daughters and four grandchildren. She spends a great deal of time with her family and enjoys playing bridge and walking. Bev joined Belmont in 2014, with her husband Peter and daughters Jessica, Rebecca and Hannah. The family immigrated from Cape Town in 2007. Bev has been happily working as Finance Administrator at a Jewish charity in Edgware since 2010. She helps with kiddush rota, 'festival food' setting up and Mitzvah Day. In her spare time she enjoys reading, baking, walking, movies, eating good quality chocolate and family time. Stephen is married to Frances with two sons and two grandsons. He is a partner in a commercial property management company and in his leisure time takes a keen interest in sport and enjoys visiting Israel when he can. Carol is Head of Volunteer and Community Services at the Association of Jewish Refugees, where she has worked for the past 13 years. She manages a team of seven coordinators and over 300 volunteers. Earlier this year she was on the organising committee for an intergenerational conference for Holocaust Survivors and Refugees at UCL. She represents the AJR on the Holocaust Memorial Day Trust Advisory Group is a member of the executive of Yom Hashoah UK, which this year arranged a commemorative event for 5,000 people at Barnet Copthall. She is a trustee of the JVN, Jewish Volunteer Network. The majority of Carol’s lay involvement has been in the field of education. She was the first female chair of governors of a United Synagogue school and for a number of years chaired the JTTP, The Jewish Teacher Training Partnership. Carol is married to Nigel and they have two daughters and three grandchildren. Salvador joined Belmont in 1988. Together with his wife Barbara, he started the Belmont Film Club in 2009. Salvador and Barbara a have three children and two grandchildren. Salvador has recently retired from a long management career with Shell International and he is currently involved with several charities, including Norwood. Salvador’s main interests are his family, friends, charitable work and Belmont Shul. He enjoys walking, travelling, bridge, films and opera. Howard joined Belmont in 2007 when he moved to Stanmore. He was Treasurer of F@B for eight years until 2016. For the past three years he has written articles for Belmonde about Jews in various countries. Howard has been married to Marlene for 25 years and together they have five children and 10 grandchildren. Howard was a practising accountant for 55 years until retiring last year. His hobbies include travel, theatre, concerts and babysitting. He was also very involved with volunteering in the wider sector including Jewish Care and the Samaritans. Norman joined Belmont in 1973. He was elected to the Board in 1974 and was the membership officer until 1976 when he became an Honorary Officer. Norman was involved in the construction of the shul and was a warden in 1981 when the building opened. He served on the Parents Association; Building Fund; Education Committee; Soviet Jewry Committee; and the Israel Society. Norman was involved in the induction of four of our Rabbis. 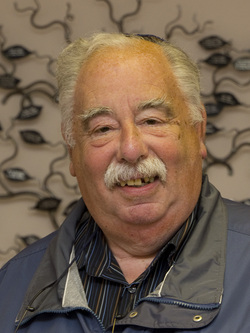 Norman rejoined the Board in 2011 and chairs the Belmont Social Group as well as being a member of Belmont Cares. One of his highlights working for Belmont was the drive to Minsk in 1990, to open a kindergarten started by two young girls from Minsk. The kindergarten is still going and the (now) women are now happily living and working in Israel. Before he retired, Norman was an agent selling menswear to the independent retailers in London and the Home Counties. Norman has been married to Estelle since 1961. They have two sons and five grandchildren. Norman is a sports fan and enjoys the theatre and eating out. Elvin has lived in Stanmore for 20 years joining the Belmont community 10 years ago. Elvin is involved with the Belmont Community Cares team and, on Mitzvah Day, can often be seen with gloves and black rubbish bin outside the Shul! A keen bridge player, he also serves on the Belmont Police Ward Panel. Carole joined Belmont in 2005. Carole is a member of the Belmont Community Care and Kiddush rota. Since her retirement working in an Investment Bank, Carole has become involved with the National Animal Welfare Trust and organises induction programmes for new volunteers. Her special interest in the big cats has led to two volunteer projects in South Africa. She is also interested in sailing, amateur dramatics, opera, gym, reading and walking. Illona has been a Primary School teacher for 30 years, with 25 of them in Jewish Education. Most recently she joined the staff of Beis Yaakov Primary School in Colindale. Illona moved to Stanmore in 1997 and became a member of Belmont Shul with her husband Stephen. Since then they have enjoyed attending many community activities and events with their two children Katie and Dan. Recently Dan has been Barmitzvah at the Shul and Illona have joined the Kiddush Rota. In her leisure time, Illona enjoys oil painting and has attended art classes for many years. She also enjoys going to the gym and Pilates.